Horizontal collaboration between enterprises or/and between public organisations can create significant competitive advantages or can be a requirement to realise common sustainability goals. On the other hand there are a number of important challenges to overcome. There are always clear identifiable causes that will determine success or failure. These causes go beyond vague notions such as trust. Already at an early phase in horizontal collaboration initiatives we identify cause-effect relationships that will have an impact, sooner or later. We help our clients to overcome challenges and to mitigate disadvantages by a better horizontal collaboration project design and management. Our experts have supported and managed many successful horizontal collaboration projects, including the outsourcing of functions to a third party, in the field of sustainability in the Netherlands, Belgium and at the European level. Our services include the initial assessments of risks, the pros and cons at the total collaborative network level and at the level of each participating enterprise, feasibility studies, multi-objectives and multi-stakeholder analysis, competition laws, system dynamics, collaborative network design and project management. 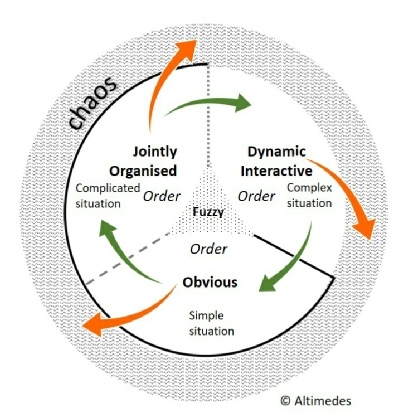 Altimedes developed the Comprehensive System Analysis Model (CSAM), a theoretical representation and framework, used to understand the impact of situations in terms of different cause - effect relationships (known, knowable and retrospective knowable), on how actors in a system interact to achieve individual or/and collective goals and how to resolve paradoxes which arise from the need to combine different ways of (inter)actions in human systems. It is a further development of the Agreement vs Certainty Matrix model of Prof. Ralph D. Stacey and other previous models. The Comprehensive System Analysis Model has been developed by Erik van Agtmaal and a team of management consultants in Altimedes Consultancy. The model makes a difference between three distinct types of cause-effect relationships (phases) in a system, surrounded by a chaotic situation. Each phase has its own characteristics and SWOT (Strengths, Weaknesses, Opportunities and Threats). A specific phase can be more or less dominant in a system. This can be different per level in a system. The agility of a system (e.g. mobility system, defence system, … ) depends on the ability to switch from one phase of interaction to another, depending on the situation. The CSAM is also used to understand intentional and spontaneous (clockwise and counter clockwise) dynamics in a system, fuzzy order, border areas or border lines between phases (phase transitions), the impact of the organisational structure, culture, communication channels and individual characteristics and how actual or new configurations of different phases at multi levels determine the behaviour of actors and the performance of a total system. The Altimedes CSA Model is a strong instrument for Strategic Decision Making, Compound Risk Assessments, the development of Climate Mitigation policies, Collaborative network management, Organisation design etc.